The wonder of space travel was used to help pupils at Crowlands Primary School improve their reading. A group of mixed ability children attended a six week after school reading club with the main aim of improving their reading. However, by incorporating art and crafts, online games and role play the pupils have also come away with increased confidence, improved concentration and they’ve enjoyed a unique opportunity to express their own creativity. The sessions were delivered by Noel Gordon, Books of Adventures, a local resident and author who pledged his time to facilitate the club as part of a Tottenham Charter commitment. Having recently published a children’s book about space travel, Gordon wanted to use that knowledge and his personal experience with dyslexia to help develop young people. “At first the kids weren’t sure what to expect but once we got into the activities and they realised that it wasn’t just about reading, they really opened up.” Said Noel. Each week the children spent an hour practicing their reading, playing online grammar games, writing, editing and adding illustrations to their own space travel book…and building jet packs to transport participants to outer space! 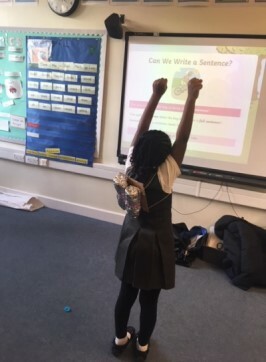 “We knew that to achieve the best possible results the club would have to be fun and high energy particularly as it was coming at the end of a full day of lessons at school.” Said Tracey Edwards-Tyndale, Year 1 teacher with responsibility for teaching and learning who played a supporting role. 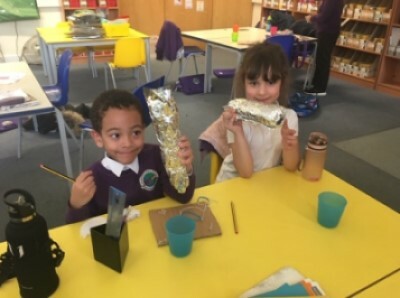 “We incorporated activities like building spaceships and creating aliens to hold the children’s attention. It worked well. It captured their imagination”.